Who knew that a low budget film would spawn five sequels? Certainly not I, but I knew after seeing Saw that it we would end up with a Saw II. Fast forward five years and here we have Saw VI. If you read my review of Saw V, you’ll know I’m a bit of a Saw fanboy, and proud of it, and I’ve been eagerly awaiting Saw VI for several years, as it was announced that the same team of writers (Marcus Dunstan and Patrick Melton) would write Saw IV, V and VI and that Saw VI would effectively be the conclusion to the series (all be it that Twisted Pictures have since said that they’ll make as many Saw films as the fans demand), but, in this case, it seems like Saw VI was indeed written to be a bit of a wrap-up. Like the title says, this is a spoiler-free review, so I’m not going to get too deep in to what Saw VI contains, but it does have enough to keep us Saw fans happy. Gore. There’s quite a bit of it in Saw VI, the result of Strahm’s demise is shown, as is how Hoffman manages to plant things on Strahm. Several traps are quite bloody, especially some of the shots (literally!) in the now infamous carousel sequence. Story. This, like Saw V (I think), is definitely a story orientated film as it shows us quite a lot of background detail involving Jigsaw and his cohorts, Hoffman and Amanda. And of course Jill. What’s in the box that Jigsaw left her in his will? What was in the letter that left Amanda so distraught? Saw VI tells all. And more. The acting is good throughout, only a few bad performances from the I’m-thick-as-two-planks-and-dropping-hints-aplenty Fed. I loved Saw VI, an hour after seeing it my brain was still in overdrive trying to place all the pieces into the timeline and trying to figure out what loose ends are left for the inevitable Saw VII. 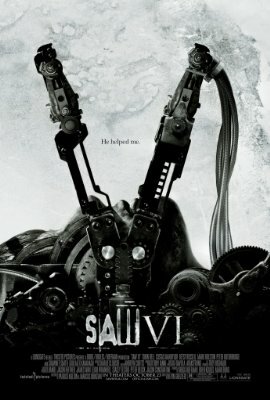 If you love the Saw series, and are following the story closely, like I am, then you’ll love Saw VI. This entry was posted in Gore, Horror and tagged amanda, bell, gideon, hoffman, jigsaw, jill, saw, saw 1, saw 2, saw 3, saw 4, saw 5, saw 6, saw 7, saw I, saw II, saw III, saw IV, saw V, saw VI, saw VII, tobin. Bookmark the permalink. I agree with this review 100%!!! Hell Yeah, Ronnie! I actually watched Paranormal Activity in the hope it would put me in a Halloween mood. What a piece of CRAP! I must be the only one to think this because it blew Saw VI out of the water in money grossed. Well, people are stupid sheep and tend to believe what ever ploy advertising uses. I’m with you, I loved Saw VI. I guess I’m just as sick & “twisted” as they come. Happy Halloween! !